This article or section contains information regarding scheduled, forthcoming or expected future variant(s). While this minifigure has been released in some form in the past, a new variant is expected for release soon. The content about any future variants may change as the release approaches and more information becomes available. 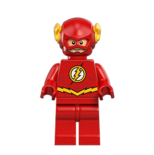 The Flash (alias Barry Allen) is a DC Universe Super Heroes minifigure who first appeared as a character in LEGO Batman 2: DC Super Heroes and LEGO Batman: The Movie – DC Super Heroes Unite. He was physically released in 2014. A Mini-doll figure was released under the DC Super Hero Girls brand in 2017. Flash has a newly moulded helmet with yellow bolts on the side. His head is red and printed with eyes, angry and smiling expressions, and the bottom of the helmet. He has a muscular torso in red with his lightning logo against a white circle and a yellow lightning belt. The back is printed with a the suit cut on his back and the continuation of the belt. Flash's legs, arms, and hands are all red. 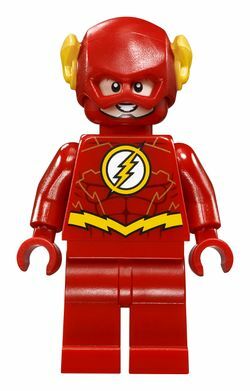 Flash has a red helmet with two yellow lightning bolt decorations on the side. His has a muscular torso in red with his lightning logo against a white circle and a yellow lightning belt. Flash's legs, arms, and hands are red, but he also has yellow boots on his legs. In console versions of LEGO Batman 2: DC Super Heroes, Flash is capable of zooming through objects and destroying them. His combats are faster than any other characters, even his body parts move at the same speed. He is also the only character able to build deconstructed LEGO bricks back together, as this ability must be used to activate several Bat Terminals. In portable versions, as well as having super-speed, Flash has the Acrobatic ability and so can double-jump, jump through acrobatic hatches and swing on acrobat poles. He is mainly used for activating special red treadmills with his super-speed, which can unlock minikits, soundbites and power bricks. The Flash also has a slightly different cowl and face in the portable version. His minikit can be found in the level "Final Battle" and he costs 300,000 studs to purchase. 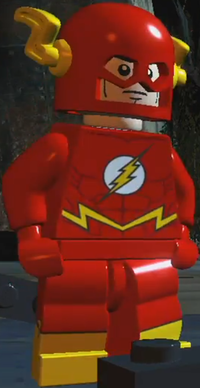 In LEGO Batman 3, Flash is updated with his physical appearance. He has the ability to run fast, has fast build without needing the "Fast Build" Red Brick activated, can run on treadmills, and can build objects which require the use of super speed. The Flash also has the ability to spin around like a hurricane, causing damage to those he runs in to. Barry Allen was known for being slow and easy-going. While a senior in college (with a major in organic chemistry and a minor in criminology) he helped the police apprehend a criminal at a bank robbery, he was offered a job as a police scientist in Central City. One night, during an electrical storm Barry was working on an experiment when a lightning bolt zapped a cabinet of chemicals, and the electrified chemicals bathed him. Through several events that night and the next day, including running past a taxi, catching items a waitress dropped, and saving Iris West from a bullet, Barry discovered that he had gained super speed. Flash's rogues gallery includes villains such as Captain Cold, Captain Boomerang, and Gorilla Grodd. He is also a member of the Justice League, which mainly consists of Batman, Green Lantern, Superman, Wonder Woman, Aquaman, Cyborg, The Martian Manhunter and on some occasions Nightwing, Batgirl, Huntress, Zatanna, Hawkman, and Shazam. Flash is one of the Justice League members being who answers Martian Manhunter's call to Gotham, but arrives later than Cyborg, Green Lantern, and Wonder Woman. He enters after the Joker robot has fallen from Wayne Tower and helps Green Lantern quickly repair the base to relieve Wonder Woman and Superman, who faints. He then participates in finishing off the robot and then defeating The Joker and Lex Luthor. Flash is later one of the Justice League members on duty when the Watchtower is hijacked by the Legion of Doom. Vicki Vale mentions that The Flash fought the Joker robot at Wayne Tower with Green Lantern and Cyborg, but he didn't appear until right after where he helped Green Lantern stabilize Wayne Tower and caught the fatigued Superman. He does, however, appear in that scene in LEGO Batman: The Movie - DC Super Heroes Unite. The Flash is one of only two characters who appears in cut scenes but never speaks in the game. The other is Catwoman. He did speak in LEGO Batman: The Movie - DC Super Heroes Unite, which can also be said about Catwoman. In a freak lab accident, forensic scientist Barry Allen was struck by lightning while doused with chemicals giving him the super powers of the Speed Force. Now he races up buildings, across oceans, and around the world at light speed, as The Flash. While The Fastest Man alive is constantly moving at top speed, his eyes are always focused on his goal: catching criminals and locking them away... in a flash! The Flash In a freak lab accident, forensic scientist Barry Allen was struck by lightning while doused with chemicals giving him the super powers of the Speed Force. Now he races up buildings, across oceans, and around the world at light speed, as The Flash. While The Fastest Man alive is constantly moving at top speed, his eyes are always focused on his goal: catching criminals and locking them away... in a flash! This page was last edited on 25 August 2017, at 14:25.